A unicycle is really just a bicycle, stripped down to only the most necessary components. There are no gears, there is no derailleur, no brakes, no handlebars and most importantly, no front wheel. 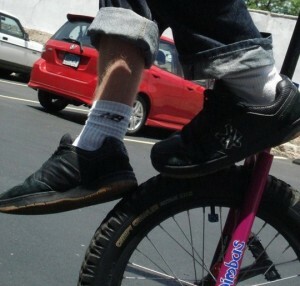 Because virtually all unicycles are fixed gear, unicyclists cannot coast the same way a bicyclist would. You cannot “ride” the unicycle, you must “drive” the unicycle. The unicycle and the unicyclist must act in harmony to maintain equilibrium. It is the perfect union of man (or woman) and machine. …and met the ground. This wasn’t going to be as easy as I hoped, but I stayed at it. After two days, I could go a few feet. After three days, I could go across the driveway. After a week, I could go most of the way down the street. After a month I could go around the block. Thirteen years and half-a-dozen unicycles later, and I’m still at it. I perform and make a living on a unicycle. I teach unicycle. I ride unicycle for fun and for exercise. I commute to work on my unicycle. Needless to say, unicycle is a huge part of my life. The beauty of unicycle is that all you need is a one-wheeler, a little determination, and some guts. I’ve seen children as young as 10 and adults in their 60s learn to ride. It’s never too early or too late to start! Click here to view our full line of unicycles.